Ebooks, Videos, & Software to Fast-track Your Aiki Skills! Grab some amazing Free Aikido products at this site. I have a wide variety of ways that you can get information from me, including... newsletter, blog, email courses, ebooks and software. And, best of all... some of it is absolutely FREE! Why do I give so much information away at no cost? It's simple really - I follow the aiki principles that I have spent 30+ years studying. The idea is that YOU Give MORE Than You Receive! In fact, my Aikido Health Centre website, which I began in 2002, is dedicated to giving more than I receive. It is a work of love that I offer to people who are members of the world community... everyone! So, exactly what free aikido and health info is available to you? If you enjoyed my free products, I would really appreciate a donation to support our work at the Aikido Health Centre. Many thanks for taking a moment to Donate its appreciated! Well, by now you have already got a ton of Aikido information and software products, BUT here are some amazing offers. For years, I have been frantically getting my thoughts down, and have produced several unique ebook and video products. They include several valuable free aikido and health bonuses too. My Aikido Success Blueprint is a unique ebook that will get you on the fast-track and show you exactly how to develop your Aikido skills to an amazing level. A Massive Collection of Wisdom! 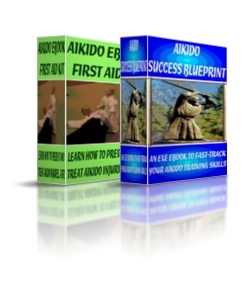 My Aikido First Aid Kit ebook shows you step-by-step, exactly how to prevent and treat aikido training injuries... and its FREE! Click Here for Full Details! My Optimum Health Secrets is a massive collection of information on how to be truly healthy. It includes 4 FREE Harmony ebook bonuses giving you dozens of interesting articles that I have written since 2002. Both of these are product packages that are the best value. You can also purchase my products separately, at low prices. If you want to cherry pick... go ahead and Click Here! you'll be told every time I post a message on there.